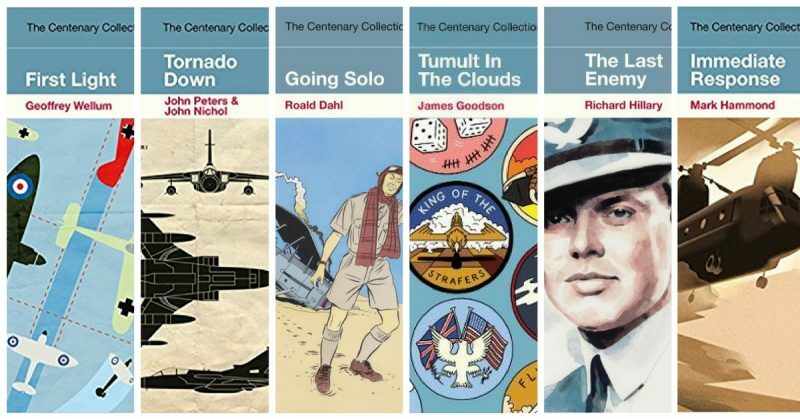 Our friends at Penguin have released a set of six books celebrating the centenary of the Royal Air Force. I hadn’t taken note of what was on offer before they arrived and am impressed with the selection even though I had read four of them and still have three of those in my library. Ever the maths genius, I was alive to the fact this left me a choice of two to consider for review. It was an easy decision. I am a few weeks off reaching my 59th birthday and have never read anything by Roald Dahl, so this was a golden opportunity to rectify the omission. My kids are long since grown up and paying their own taxes and they will confirm how much their mother and I encouraged reading and a love of books when they were young. We would read together on a regular basis and it was important for me (and them) that this was so. We read a lot of stuff but never at any point did Mr Dahl cross my path, even though my kids read plenty of his stuff under their own steam. So, here we are then. This lovely little book is beautifully written, quite whimsical and self-effacing in that ever so English way of doing things. Mr Dahl was a fighter pilot flying Gloster Gladiators and Hawker Hurricanes throughout the wartime element of this tale but starts his story in pre-war East Africa where he worked as an agent for Shell. He tells us much about the expanse of territory he was expected to cover and a good deal about the eccentric expats he met along the way. We are treated to a number of sphincter tightening moments with poisonous snakes and lions. His description of the local people who worked for him are priceless and utterly sincere in their warmth. Then the war gets under way and within a short time our hero is shooting down Ju88s over Greece. Yes, this is the same Roald Dahl who gave us Matilda, the BFG and Willy Wonka. This adds a serious dimension to a man who is probably not associated with being a fighter pilot. But the fact is he had a serious war although the combat phase was brought to a close due to injuries sustained when he had a landing accident. All will be revealed when you read the book. Please do so. That Dahl is now acknowledged as a fighter ace adds to the kudos of a man who was a great writer for both adults and children in addition to screenplays for some well-known movies. This book seems to match what I have read about him, in that his whimsical approach to very serious matters shines through especially when he downplays danger and tragedy. The book ends abruptly with his return to the UK when his combat flying came to an end. He went on to do a lot of important work serving as assistant air attaché in Washington DC. I recall a biography of the great bomber pilot Guy Gibson that speculated Dahl had helped him write the classic Enemy Coast Ahead while he was on a PR mission in the United States. It seems Dahl was also involved in a fair bit of cloak and dagger stuff. This makes him even more fascinating. Of the other five books, the four I read previously include the enthralling autobiography The Last Enemy by the fighter pilot Richard Hillary. He suffered terrible burns and was one of the famous guinea pigs of the pioneering plastic surgeon Archibald McIndoe. The great doctor did his stuff, because despite his injuries, Hillary was able to get back in the air, but he was killed in 1942. This leads us to one of my favourite aviation books First Light by the much-revered Geoffrey Wellum. He was just a teenager when he fought in the Battle of Britain and he went on to serve in the defence of Malta. This wonderful book was written in later life and might have remained unpublished, but it was brought to the attention of Penguin who have every reason to add it to this clutch of special edition paperbacks. Mr Wellum will be ninety-seven this year. Like Richard Hillary’s classic, I first read James Goodson’s Tumult in the Clouds when I was a much younger man. He was an American who served with the RAF before transferring to the USAAF. Goodson was fortunate to survive the sinking of the liner Athenia when she was torpedoed within hours of Britain’s declaration of war on 3rd September 1939. The ship was packed with American and Canadian citizens leaving Europe. The effect was to make the young Goodson determined to join the fight. Tornado Down is a quality read by John Peters and John Nichol, the crew of a bomber shot down during the 1991 Gulf War. They endured a torrid time as prisoners of the Iraqis and were paraded on television, leading one British newspaper to run grabs of their battered faces under the banner headline THE BASTARDS OF BAGHDAD, referring to the brutality of the men’s captors. While Peters stayed in the RAF after the conflict, John Nichol went on to build a respectable career as a historian and I have enjoyed both his books and an occasion where he gave a talk. It must surely be fair to say, that, like Dahl, John Nichol’s wartime experiences had a direct impact on his future as a writer, albeit of a very different genre. This leaves us with Mark Hammond’s Immediate Response the one book of the six I have not read, but I will remedy that as soon as I get time. Mr Hammond was a Royal Marine helicopter pilot on exchange with the Royal Air Force who had a busy time in Afghanistan. That is all I can tell you thus far. There you have it. Six quality books in a very nice set produced with matching covers, including a medal ribbon motif running through the spines in The Centenary Collection. Each book has a cover price of £7.99 in the UK and this is very reasonable. I really like the approach to this and have treasured many of these books, some for forty years or so. Don’t ask me to pick a favourite. The five I have read have all been important to me at some stage or another in my lifetime. They come very highly recommended.